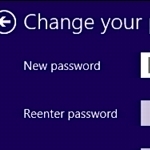 Changing Account Password in Windows 8? Glad to hear that you have switched over to the new Microsoft Windows 8 system. It’s definitely different to the previous generations of Windows and there are times when running it on a non-touchscreen device will make you feel like a second class citizen (I’ll show one of those in a bit!) but still, it’s the future and there’s a lot to like about it, including the new start screen. A very different world. Still, not being able to find what you want is a real drag and if you’re trying to manage your own privacy and security settings, well, that should be really easy to find, right? Fortunately, if you’ve been poking around even a bit you know how to bring up the main control strip on the right side of the screen (tip: move your cursor to the top or bottom right corner of the screen to bring this handy toolbar on screen). My windows phone cannot sync because it has my grandkids hotmail account and my husbands name on my mail and I have never had anything to do with those names. How do I change these names to mine?